Background: Volunteered to participate in annual death games of a dystopian future in order to save the life of her little sister, Katniss soon became the beacon of hope and rebellion. 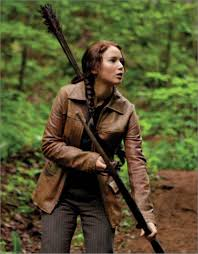 Katniss survived not one, but two versions of the Hunger Games and became a symbol of the rebellion soon after. She has intense skills with a bow and arrow, as well as superb survival skills. She is a girl who grew up rough, so not much phases her and not much affects her. She also possesses the power to inspire many people across the districts of Panem.